For a stay in the capital there is nothing better than a hotel located in the heart of the city's centre! The Mercure Roma Centro Colosseo is in a strategic position, on Via Labicana, just a few steps away from the Colosseum, the Roman Forum, the Basilica of St. John Lateran, Trajan's Market and other important historical landmarks. The hotel is also well-connected to the rest of the city with underground train and bus services that stop close by. Thanks to its strategic position in the heart of the city, just a stone's throw from the Colosseum and the Imperial Fora, this modern hotel in central Rome is the perfect place for anyone looking for a comfortable stay in the Eternal City. Your every wish will be fulfilled. Choose from the categories available, single, double and triple rooms, Standard or Superior, the latter with a splendid view of the Colosseum. A contemporary lounge area where you can relax with a drink or enjoy a dish from our menu. Our friendly staff are on hand to offer you gastronomic delicacies, finger food and much more. 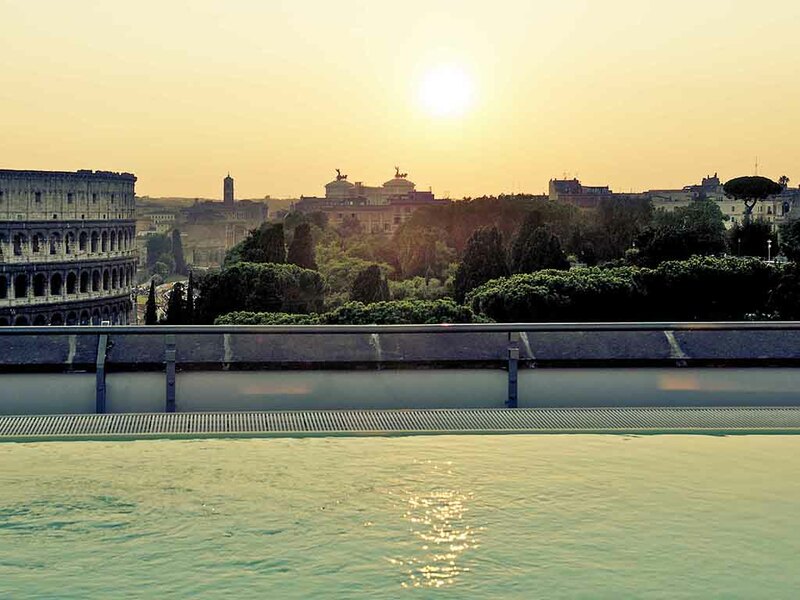 During the summer period, you can indulge in our cocktails on the terrace while enjoying the splendid view of the Colosseum and the rooftops of Rome. The hotel is in a great position, less than 10 minutes stroll to the colosseum and the metro. It is modern and clean but does not have a lot of character. Our superior room with a view of the colosseum was spotless but cosy. Breakfast was very good, plenty of choice but was very busy. First time we stayed.Staff friendly ,knowledgeable and polite. Waking up to the view of the Colosseum every morning was exceptional. The staff were pleasant and helpful. The restaurant service and food was impeccable. Alessio, the waitperson was especially welcoming and efficient. Friendly and helpful staff, clean room, extra touches were appreciated! We were staying on our honeymoon and were very pleased with our experience. This hotel is in a terrific location, close to the Colosseum and numerous restaurants. We were greeted with friendly staff that spoke English very well, and were provided a room upgrade (although not a view of the Colosseum, which my original room reservation was for) and received a special gift for our honeymoon. Staff at the bar/restaurant were very friendly! Hotel staff were friendly and extremely helpful. Room was amazingly spotless and a good size. Very good. No complaints at all, staff were very friendly and helpful. Nice room. Good location. Helpful staff. Breakfast not great if you are vegan although they do provide soya milk so you can have cereal and a tea or coffee. It would have been useful if they provided non dairy ‘butter’ for the bread. Besides the amazing position and the terrace with breathtaking view this hotel has really an extremely nice service. Everything just perfect from check-in to checkout. We found the hotel very clean and comfortable, and all staff we met were pleasant and professional. Overall, it was a wonderful break. The reception staff particularly were terrific especially a young lady who I cannot recall her name But she spoke exceptionally good english and was very helpful on Saturday and Monday. The location of the hotel is terrific. The only downside was the air conditioning our room wasnt able to change temperature and was always hot as was the restraunt. Extremely satisfied and VERY helpful Staff!! The Hotel was very clean and I cannot say enough about how helpful the staff was. I would highly recommend to anyone to stay at your hotel, we loved it! The hotel was spotlessly clean. Room service was 100%. The desk staff were excellent and the breakfasts were perfect. The location of the hotel is great for visiting all the sites. It's only metres away from the Colosseum and only about 20 minutes walk to Trevi Fountain.